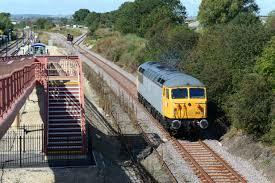 A New Line for the Glos-Warks Railway? Should the GWSR seek to build this line from right to left across these fields to provide a southern mainline link once more? The Glos-Warks railway seems to have come a long way since our very existence was threatened by the two almost catastrophic landslips at Gotherington and Chicken Curve. It wiped out the bank accounts and it took some tough decisions to merely survive, let alone thrive. Today, though, a huge transformation is in progress: the Bridges to Broadway appeal has been a massive success and track laying is due to start. By the summer, the railhead should be within sight of Broadway station. Trains should be running in 2017 and a new world of opportunities will open up for us once we become a presence in this famous Cotswold town. It is easy to get ahead of yourself in all this expansive energy and we forget the slips period at our peril so once the first trains pull into Broadway, it will probably be time for some consolidation and thinking. We desperately need better accommodation for carriages, locos and there are a host of other improvements that we need to think about. The trouble is that I can’t help thinking: where to next? 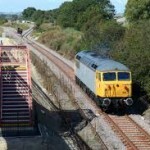 The preservation pioneers who wanted to save our line wanted to buy the whole line, double track and all, from BR between Honeybourne Junction and Cheltenham. In reality, we got a trackbed and not a lot else and it has been a slow process rebuilding with a purely volunteer workforce. At Honeybourne Junction, Network rail have already provided ‘passive provision’ for our future trains at Platform 3 (to the left of the Class 56 in this photo). could go in both directions: further north to Honeybourne and/or south to Cheltenham. Both will be expensive and many people will argue persuasively that we can neither afford it and that it will not deliver the traffic (read: income) we imagine. 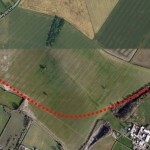 But an old idea has resurfaced that might just be an answer to the southern end dilemma: why not build a new line across the fields to rejoin the old Midland line north of the NR station at Cheltenham, as in the photo above? the line would leave the existing formation just under the road bridge at Cheltenham Racecourse Station, turn right and then left, crossing not much more than one large field and rejoin Network rail north of Cheltenham Spa station. the distance is only 1.51 Km and a sale of the remaining trackbed south of Hunting Butts tunnel to housing would release a substantial proportion of the funds needed to get the project under way. This was, apparently, mooted along while ago but it is an idea worth pursuing when we consider the medium to longer term future. A lot will change for our movement in the next 10-15 years and we should start debating these kinds of issues now.